Came across a mention of my strange nowhere accent on a thread in the boards.ie radio section this evening. Although I was born in Dublin, and lived here until 19, I seem to have picked up a sort of English accent while living in the UK between the ages of 19 and 35. But it is only noticable to Irish people, who hear me as British, while British people hear me as Irish! Listening back to recordings of my various jobs on radio, I can certainly hear how much my speech has changed – I listen to a clip of myself on South East Sound in 95, or my early months on Caroline in 87 and think “what a strong Irish accent”. By the satellite Caroline era of 98/99, and particular my sojurn at SUSY Radio in Surrey in 2000, I was sounding much more Home Counties, indeed, far more so than I do now, as I seem to be gradually reverting back to Irish again in the years since I came home. I guess, for now, I am somewhere in the middle of the Irish Sea accent-wise – International Waters I hope! Neil Young has slated the iPod and similar devices, bemoaning the lack of musical fidelity and comparing them to a child’s toy, according to this article on Macworld. “I absolutely hate the fact that it’s possible to release music at the same quality it was created, yet the market has moved backward to something that’s little better than cassettes.” he is reported as saying. While I can understand where he is coming from – as the creator of musical works he must hate to hear them “watered down” to lesser levels of reproduction – I would argue against the sentiment that this is a tragedy for music, as long as the originals still exist in their fullest quality, and are available to those that want them. For many people, the mp3 player or iPod gives the opportunity to carry a vast library of music in the pocket, and is the key for escape to a million worlds of sound and lyrics at different points during a busy life. Music lives more the more it is heard and lived with, and for those who are happy to listen in slightly reduced quality surely it is better than not having the music available at all? For most people, myself included, it actually represents a vast increase in quality and depth from what went before – I spent more than half my life in an era when music was mainly heard on the radio, overwhelmingly on medium-wave, in mono and with competing sounds of interference and atmospherics. The iPod may not be hi-fi, but it is science fiction compared to the choice available in my youth. Great night at the Odessa Club in Dublin yesterday where we launched the new weekday morning schedule for Phantom 105.2. Though I had to slip away early to present Bedrock, I enjoyed the first couple of hours and managed to catch up with the other part-timers who like me slip in and out of the building at odd times in the hours of darkness. The new schedule – described below – includes some great presenters, and I really look forward to hearing how it sounds in practice. “The breakfast show, Pure Morning, which will run from 7am-10am, will be hosted by well known DJ, Richie McCormack, supported by Charlotte Flood. Richie has worked with Phantom 105.2 since 2002 and for the past two years has been working with the station presenting its new music show ‘The Producers’ which gives many bands their first exposure on Irish radio and producing the popular ‘Stadium Rock’ on Saturday afternoons. Producer Charlotte is new to Phantom and joins the station from XFM in South Wales. Michelle Doherty, who also presents Channel 6’s late night interactive music show ‘Nightshift’, will present ‘Finest Worksongs’ from 10am-Noon. Michelle will bring her love and knowledge of the alternative music scene to deliver great music for those at work. Michelle and Charlotte are new to us – welcome! – and they have both done good stuff elsewhere. Richie has been around at Phantom forever and steadily shining brighter. Sinead will be doing the new music/entertainment magazine show, Front Row, and if her recent fill-in on Access All Areas is anything to go by, she’ll be brilliant. I remember when she joined in 2004, I used to read the new during her Saturday afternoon show, and thought she was one of the best new voices I had heard in a long time. I’m off to do Bedrock now, and will be back with Random Access as usual Sunday evening 7-9pm. NOTE: This is now in the past. Bedrock is great fun to present, the best in new and classic rock with a late night feel, I’m looking forward to this. I’ve always enjoyed late night radio, the atmosphere is much more personal. Have a listen if you fancy some bedrock, you can catch phantom on 105.2FM in the Greater Dublin area, or UPC Cable Ch 935 nationwide, on DAB in the north eastern region and also DTT trial system. (Note: this piece was originally written back in 2008 when I was still working on the final edits ofthe book which was originally published as Shiprocked – Life On The Waves With Radio Caroline. It is referred to here by my earlier intended title, and the excerpt quoted in fact never made it into the published version for reasons for space). I’m back from my week long retreat down the southwest, where I spent my time lazing, writing, and thinking (in pretty much that order). 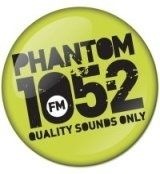 Back presenting Random Access on Phantom 105.2. And counting myself lucky to be alive. Not because of anything that happened to me during the week, but because, like a good writer, I was trying to please my editor, and ended up stirring up some sleeping dogs from the recesses of memory. When I say editor, Sarah (from the wonderful Seven Towers Agency) is actually my agent, but she is going through an editing process with me on the book, Somewhere Down The Crazy River, as part of the preparation for marketing it to potentially interested publishers. It’s an interesting process for me, having someone with no detailed background knowledge of offshore pirate radio reading the text, and giving me the thoughts and comments that hopefully future readers would raise with the current version. Some minor typos corrected, comments on the flow and occasional suggestions for rearrangement of paragraphs, and gentle prods to include background information when certain sections rely too much on my own instinctive knowledge of how it was back then. 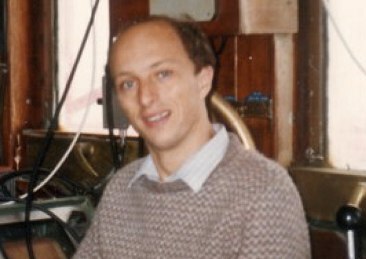 Amongst the material I had to examine or rewrite while on holiday was a section which takes place in high summer, on board the Radio Caroline ship Ross Revenge in 1987. Sarah had inserted a note asking what we were doing in our off-air free time, stuck out on a ship in International Waters, on the hottest days of the year. I’d written a lot about surviving the storms of winter, and about the many mays of keeping amused on stormy nights, and the various crisis, adventures, friendships and rows that made life at sea spark. But the hot days of June . . . racking my brains I thought about the sunbathing – not all that interesting – and then it came to me, something I had totally forgotten over the years: the swimming! This far out at sea there would be no room for mistakes, and swimming sessions were strictly a group rather than a solitary activity, with two people watching over the side, and safety buoys deployed and attached to the ship by ropes. Tidal streams in the Knock Deep were strong, and we had no rescue craft to go after anyone who was swept away, so swimming was restricted to about half an hour either side of the turn of the tide, when the current was slack. Swimmers stayed close to the ship at all times, never further away than we could throw a life buoy. Mostly we would swim up and down along the side of the ship, the more adventurous going as far forward as the anchor, or occasionally doing a complete circuit of the ship if they were strong swimmers. The watchers on deck would move around to stay with the swimmers at all times. The first time I ever ventured into the water was both an exhilarating, and profoundly scary experience. The water was cold, and there was nothing underfoot – no bottom to touch, as we were in about 30-40 foot of water in the middle of the Knock Deep. The ship beside me was my only safety, and had precious few things to grip onto at the waterline anyway. There was nothing else in sight as far as the eye could see. 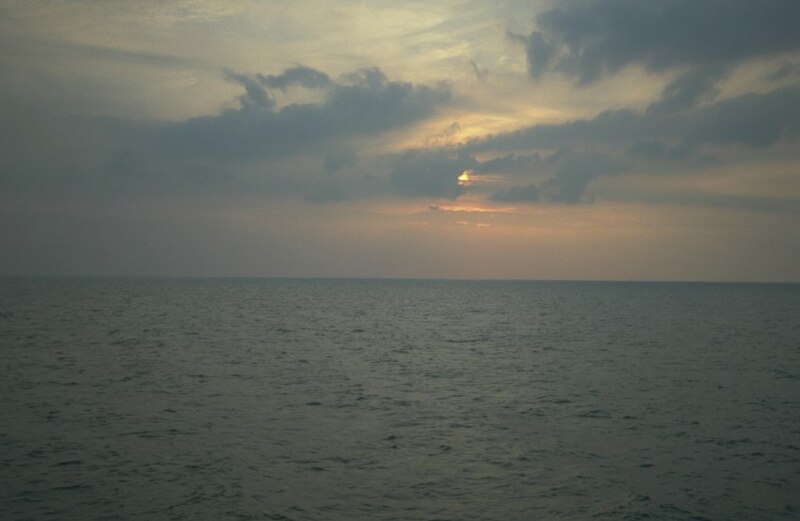 Even in calm conditions, gentle swells would lift me up and down unexpectedly. At first I just clung to the side of the ship and enjoyed the feeling of being in the water with the safety of still being attached, but after a while I became more adventurous and was able to let go, and start swimming forwards, careful not to stray more than a few yards distant as I swam alongside. Going forwards, I had a pleasant surprise when I came level to the part of the ship where the generator room was located, as the cooling water outlet was discharging lovely warm water into the sea at that point (the generators used sea water cooling, drawing in cold sea water on the port side of the ship, running it through the cooling system to discharge hot on the starboard side). The swimming sessions were enormous fun, and always seemed too short, though it was always with a sense of relief that I would climb the rope ladder and find myself safely back on board again. Radio Caroline was a wonderful time in my life, the broadcasting was fun, the life exciting, and in general we were very responsible citizens, observing shipping regulations and responsible technical standards of operation for the radio station, but there were times too when we tempted fate, jumping from ship to ship as supply boats came alongside, climbing masts for repairs – and getting off our ship, miles out at sea, and swimming happily despite the fact that there was no rescue if we got into difficulties. Maybe I’m older and less adventurous now, perhaps I’ve lost the spark, but I like to think that I’m simply a little wiser. Some of the things I have written about in the book, done without a second thought twenty years ago make my hair stand on end now. Amazing also that I had so completely forgotten this activity – that’s the purpose of a good editor when you are writing – they don’t ever write a word for you, but they push and they prod and they question to bring more colour and depth (in this case literally) to the writing. I have a rare Sunday evening off this weekend, as Random Access will be presented live from the Oxegen festival by Sinead Ni Mhorda, as part of Phantom’s Road to Oxegen weekend. I’m closeted away down in the southwest with a laptop and a whole bunch of edits to do on the book, plus an unrelated short story knocking inside of my head to be let out. So, an intensive weekend of writing, and I have to deny myself the pleasure of listening to Phantom’s Oxegen coverage over the net, as it would be just too distracting. I’ll be back on air next weekend, batteries recharged, and editor suitably impressed (hopefully!). Some excellent news – a kind soul (hello Hans!) reading this blog has passed my contact details on to Richard Jackson (see below) and we’ve just made contact for the first time in years. He’s still based in Bangkok, running a thriving audio business, and still remembering Caroline as fondly as I do.